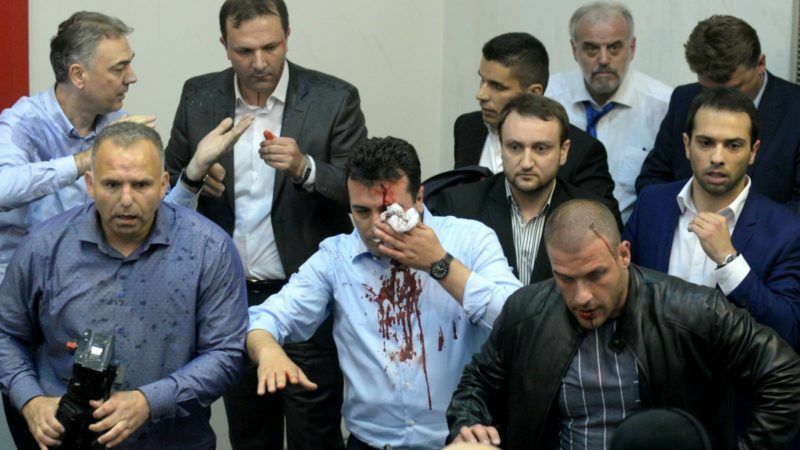 Zoran Zaev, who leads the main opposition party, the Social Democrats, was seen with blood on his face amid the chaos, while Interior Minister Agim Nuhiu told media that 10 deputies had been injured, as well as some police and journalists. The violence erupted after around 100 nationalist protesters supporting the rival VMRO-DPMNE party entered parliament waving Macedonian flags and singing the national anthem. An AFP photographer said he saw around a dozen masked men among the demonstrators, while footage showed chairs and tripods being thrown as fistfights broke out in the parliamentary press room. “I condemn the attacks on MPs in Skopje in the strongest terms. Violence has NO place in Parliament. Democracy must run its course,” said European Union Commissioner Johannes Hahn on Twitter. The incident follows months of political deadlock in the Balkan country, where demonstrators have been holding nightly rallies in the capital since an inconclusive December election. They oppose a proposed coalition between Zaev’s Social Democrats (SDSM) and ethnic Albanians, which they perceive as a threat to national unity. The leader of Macedonia’s Social Democrats said yesterday (23 February) he expected to be able to form a new government in March, having found an agreement with the biggest Albanian party over a law backing broader use of their language in the country. According to local media, Thursday’s incident broke out after the SDSM and Albanian parties voted in a new parliamentary speaker although the former speaker had closed the day’s session. Their chosen speaker, Talat Xhaferi, is an ethnic Albanian. The EU later said it took “positive note” of Xhaferi’s election. A few hours after the protesters entered parliament, police took control of the building, but an estimated 2,000 to 3,000 protesters remained outside. “I am calling for tensions to be calmed and for non-violence,” said President Gjorge Ivanov in a televised speech, inviting political party leaders to his office on Friday to discuss the situation. “No one from abroad will solve our problems,” he said. For a decade until last year, Macedonia was ruled by the conservative VMRO-DPMNE and its leader Nikola Gruevski. December’s election saw the party secure 51 seats in the 120-seat parliament – or two more than the SDSM, but the conservatives failed to reach a deal with kingmaking Albanian parties. 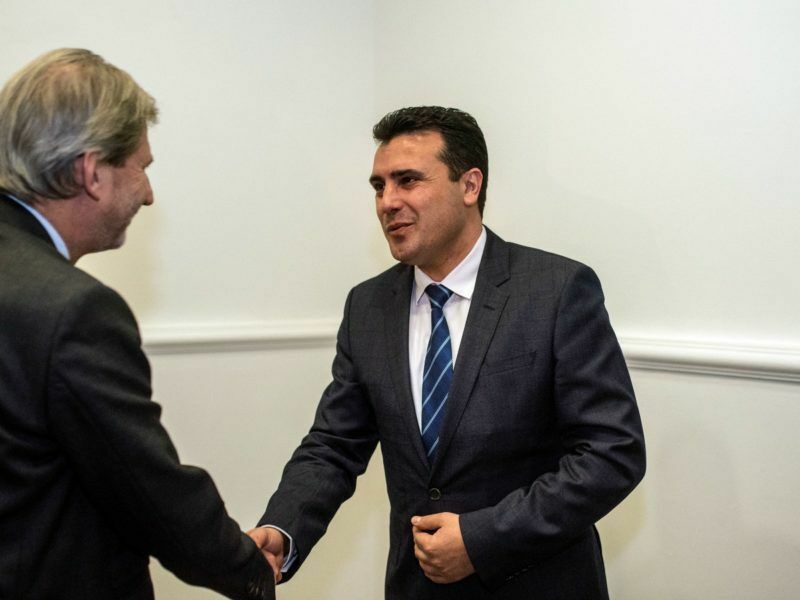 Although Zaev then reached an agreement with the Albanian groups, Ivanov refused to give him a mandate to form a government. 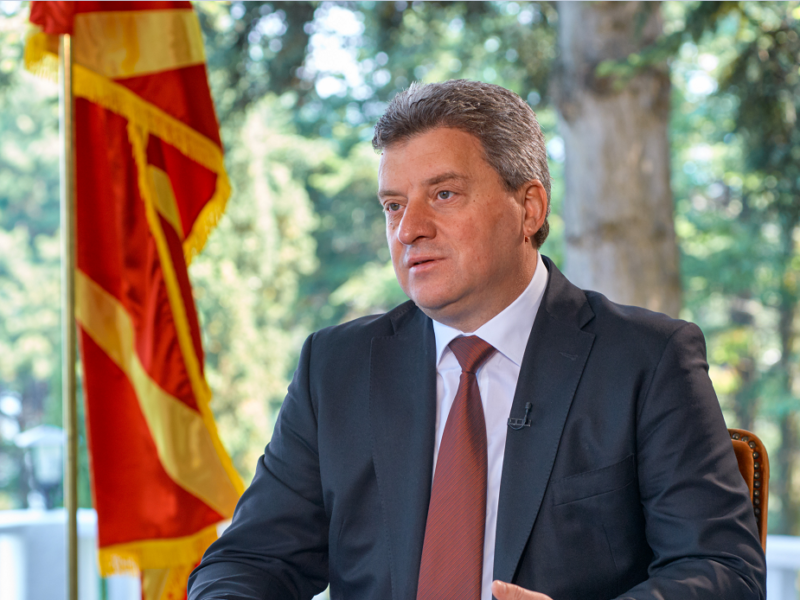 An ally of Gruevski, the president expressed concern over the controversial demand of Albanian parties that Albanian be made an official language across Macedonia. Critics of the demand fear it could lead to the break-up of the small country of around two million people, about a quarter of whom are ethnic Albanians. Following a seven-month ethnic Albanian insurgency in 2001 that left more than 100 people dead, a peace accord was reached providing more rights for the minority. The EU and the United States have urged Ivanov to reverse his decision and grant Zaev a mandate. Macedonia’s opposition has also warned its conservative rivals that they are playing with fire by using the ethnic card in a bid to stay in power. December’s vote was supposed to end two years of political upheaval, sparked by a huge wiretapping scandal, but it has only served to deepen the crisis in Macedonia, which aspires to join both NATO and the EU. Both the SDSM and VMRO-DPMNE blamed each other for provoking tensions after Thursday’s violence. A spokesman for the human rights organisation Council of Europe said the incident was “alarming”, while Albanian Prime Minister Edi Rama expressed concern over the “really dramatic” situation. Albania yesterday (16 March) warned Macedonia, where Albanians make up around a quarter of the population, not to try and turn a political crisis into an ethnic one. 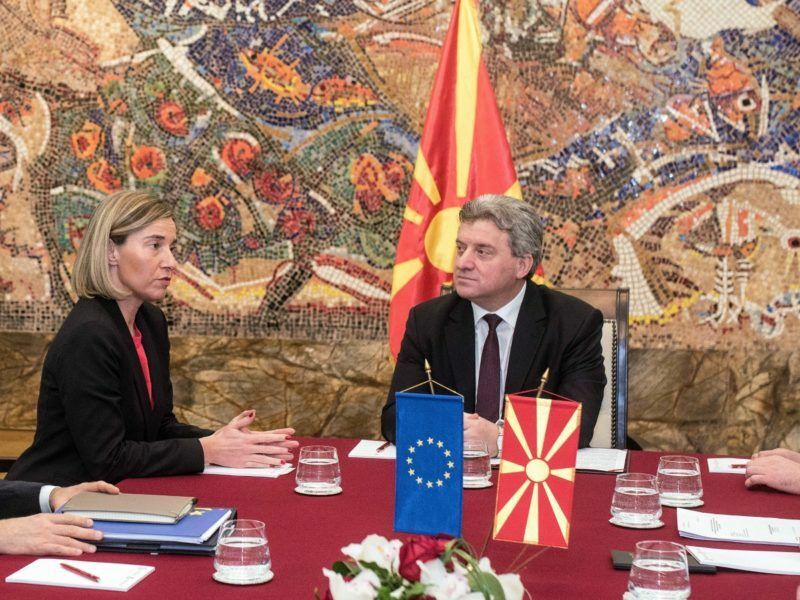 Macedonia criticised Albania earlier this month for “open interference” with its internal politics. Russia has accused Albania, NATO and the European Union of trying to impose a pro-Albanian government on Macedonia. 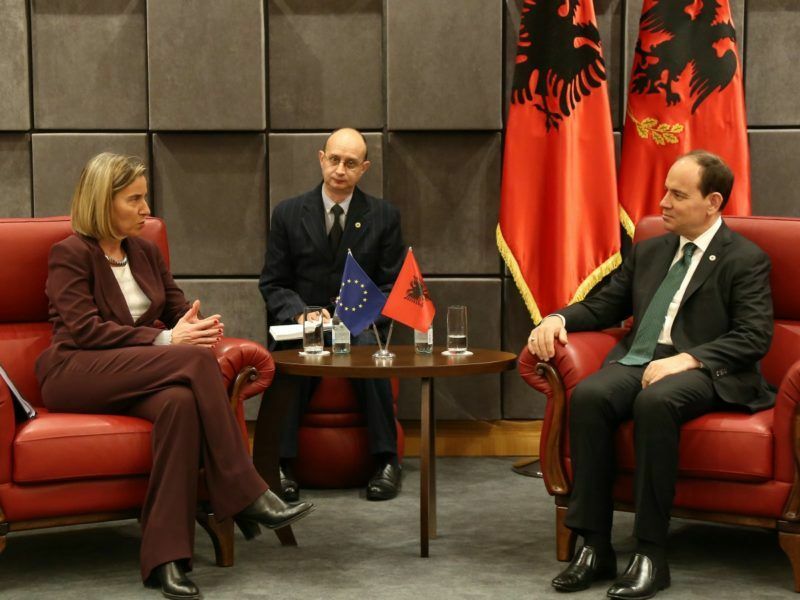 Russia accused Albania, NATO and the European Union yesterday (2 March) of trying to impose a pro-Albanian government on Macedonia, which is gripped by political crisis. “We assert that, under the guise of unfounded accusations of attempts to destabilise southeastern Europe aimed at Russia, efforts are being made to implement the Greater Albania project, now based on the Albanian constitution, which gives Tirana the right to defend the interests of Albanians abroad. Under the guise of hypocritical talk about the need to stabilise the region under the NATO umbrella, the very foundations of stability are being shaken; a new policy course has been adopted to redraw the borders in the Balkans, which will inevitably increase the conflict potential,” the ministry stated. “Their chosen speaker, Talat Xhaferi, is an ethnic Albanian” But Euroactive forgot to write that Talat Xhaferi is former leader of albanian terrorist group who killed lot of ethnic macedonians in conflict during year 2000. So for ethnic macedonians his election is same if Osama bin Laden would be elected as President of US congress. you also forgot to write that you are not former, but descendant of Alexander the Great…the same goes for Euractiv. Desperation is setting in because of the failed Antiquization policy that was imposed upon the country by Gruevski and Ivanov. The Antique ultra nationalist Slavs are so deluded with their fantasy of an Ancient Macedonian utopia that they failed to realize there are more races living in this partitioned Yugoslav land than Bulgarian speaking Slavs who are attempting to falsify history. When a country is built on unstable foundations as this one is there is no positive future. The place was doomed when they allowed a historically uneducated ultra nationalist Todor Petrov to design their original flag. It infuriated the Greeks. The star of Vergina is a Greek historical symbol. They were made to change it. The same ultra nationalist Bulgarian speaking Slavs are at the core of the Skopje 2014 Antiqization program. Did anyone stop and ask the ethnic Albanians what they wanted on the flag of this new nation. Did anyone bother to ask the Albanians what they wanted this new nation to be called. Did anyone ask the Greeks if they would give their permission for the name Macedonian to be used in their nation’s name seeing that 100% of all Ancient Macedonian lies in Greece and in fact is Greek. Did anyone ask the Bulgarians permission for their national heroes Dalchev & Gruev to be used n this nations history. Did anyone ask the Greeks permission to use Alexander the Greek in their falsified history books. Did anyone ask the Albanians permission to use Mother Theresa as a national figure in this illegitimate nations history. Name change needs to occur if there is to be any reconciliation between the Bulgarian speaking Slavs, The Albanians and their neighbors. The flag needs to be changed to a more appropriate non Hellenic symbol. The distorted school curriculum needs to be changed to a historically correct one. The brainwashing of this nation has irreparably damaged it on an international stage. There will be no inclusions – EU/UN/NATO, all will shun it unless it comes out of the cold and changes the historically distorted rhetoric. The VMRO are cultural criminals. Their legacy is a crumbling facade of grotesques baroque style structures erected in the name of history. the Bulgarian speaking Slavs blame everyone but themselves. Greek, Bulgaria, Albania, Serbia, USA. EU – no one is exempt of their hate speech. they know what they have to do in order to exist within the world community. They need to apologize to everyone that they have offended both culturally with their theft and emotionally with their racism. Reconciliation can only be made possible if this occurs. The diaspora who along with the right wing deluded antiques of the VMRO have to change their way of thinking. It’s become so toxic that they will be killing their own soon. The looming civil war which on the cards will not only pit Albanian against Slav but also Antique and Slav. They have nothing to lose for it was never going to be a nation with an exclusivity to the name. They have everything to gain. Partition seems likely but i do hope if it happens it does so peacefully without bloodshed. The Albanians have conducted themselves gracefully during this entire process. Its Gruevski and his deluded Antiquization fried Slavs that are the criminals.